Apple Thursday morning released update Mac OS X 10.6.6 for Snow Leopard, bringing the new Mac App Store, along with the usual bug and security fixes. The Mac OS X 10.6.6 update is 114.8MB and is recommended for all users running Mac OS X Snow Leopard. It includes general operating system fixes that enhance the stability, compatibility, and security of Snow Leopard. The Mac App Store brings the App Store experience to the Mac, allowing users to find great new apps, buy them using their iTunes account, download and install them in just one step. The Mac App Store is available for Snow Leopard users through Software Update as part of Mac OS X v10.6.6. 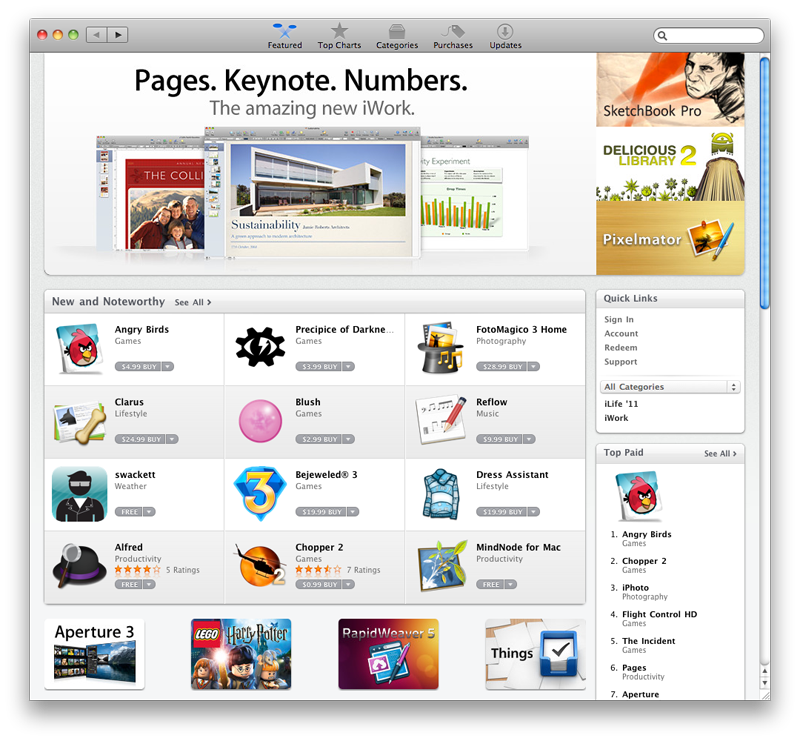 "With more than 1,000 apps, the Mac App Store is off to a great start," said Apple Chief Executive Steve Jobs said. "We think users are going to love this innovative new way to discover and buy their favorite apps." The Mac App Store offers apps in Education, Games, Graphics & Design, Lifestyle, Productivity, Utilities and other categories. Users can browse new and noteworthy apps, find out whats hot, see staff favorites, search categories and look up top charts for paid and free apps, as well as user ratings and reviews. Entirely new apps, as well as current Mac favorites, are available from developers such as Autodesk, Ancestry.com and Boinx. iPhoto, iMovie and GarageBand apps from Apples popular iLife 11 suite are available individually in the Mac App Store for $14.99 each, and Pages, Keynote and Numbers apps from iWork are available for $19.99 each. Aperture 3, Apples powerful photo editing and management software, is available for $79.99. "Were delighted to bring our professional-grade paint and drawing app, Autodesk SketchBook Pro, to the Mac App Store on its first day of launch, said Carl Bass, Autodesks CEO. "Weve seen tremendous success on the Mac, iPhone and iPad with multiple apps. Were excited to offer SketchBook Pro on the Mac App Store so artists can easily create everything from quick sketches to high-quality artwork right on their Macs." "By offering the Ancestry.com Family Tree Maker app on the Mac App Store, were making it even easier for people to discover and access their family history," said Tim Sullivan, Ancestry.coms CEO. "The Mac App Store will drive a new generation of innovation on the Mac platform." "Were thrilled to have our award-winning animation, video production and photography software available on the new Mac App Store," said Oliver Breidenbach, Boinx Softwares CEO. "The Mac App Store makes it easier than ever for consumers to access all the innovative software designed for the Mac." The store opening came before 9 a.m. Eastern time on Thursday, more than three hours earlier than was reported in a rumor on Wednesday. Apple had already announced in December that the Mac App Store would launch Jan. 6 in 90 countries. Apple first announced the Mac App Store in October, and promised a launch within 90 days. The digital download destination will serve as a Mac OS X counterpart to the iOS App Store for the iPhone, iPod touch and iPad.